In an earlier time, just prior to and following the Second World War, the general public was fascinated by the subject of crime. Numerous magazines of "True Crime Stories" filled the newsstands. Radio also helped fill the need with fictional heroes such as Johnny Dollar and The Saint. Few true crime dramas, other than Gangbusters or Dragnet, sustained long term success on radio. 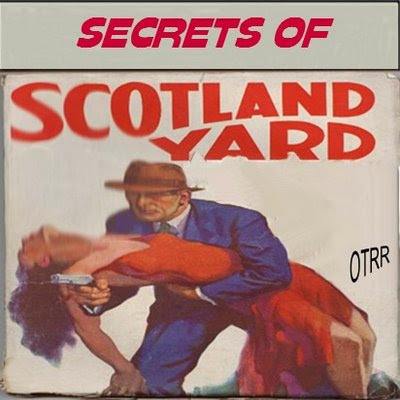 The Secrets of Scotland Yardwas a successful crime drama series, initially airing internationally between 1949 and 1951. Selected episodes finally came to a US radio network for a brief run much later in 1957 over the Mutual Broadcasting System. The series boasted well over 100 episodes, one of which, "The Bone From A Voice Box", apparently served as the prototype for another well remembered Towers Of London dramatic series, The Black Museum. In both series, well known actors were employed as host / narrator, Orson Welles in The Black Museum and Clive Brook here. In fact, the shows were so similar that some of the same actual Scotland Yard cases were dramatized for both series (with totally different scripts, and casts). The Secrets of Scotland Yard was an independent production of the Towers of London syndicate in England for world wide distribution. Each week, an audience of anxious radio-listeners tuned in to hear these true crime stories of the London Metropolitan Police unfold, as the detectives at the Yard investigated some of England’s most famous criminals. Their trials have become legendary. Stories presented in the series include the theft of the British crown jewels by Colonel Thomas Blood; the story of a man who finds an armless and legless body wrapped in ribbons and lace; or the strange story of two close brothers who love one another enough to contemplate the murder of a brother’s affluent, yet unsightly and ignorant, wife. Murders, forgery, and robberies all get a through review on the program. Each time, Scotland Yard detectives are afoot to solve the crime mystery! The Secrets of Scotland Yard was initially hosted by Clive Brook, probably for the first year or so. To add to the air of authenticity, Brook sometimes discusses matters with Percy Hoskins, a 1950s crime expert and reporter for the London Daily Express. Hoskins knew every nook and cranny in London’s seedier districts and personally reported on many of the major crimes of the day. A student of crime, Hoskins was also one of the founders of the Saints and Sinners Club of London, an educational organization dedicated to true crime investigation methods and results. Brook had his own Scotland Yard experience previously when he played retired naval commander Stevenson in the 1936 film, "Scotland Yard Commands". American audiences will however probably more familiar with Brooks’ portrayal of Sir Arthur Conan Doyle’s Sherlock Holmes in the 1932 film of the same name. Brook was eventually replaced by an actor portraying the character Superintendent X of Scotland Yard.